The hub is in India for a few days on business. In the middle of the first night, I heard someone tip toe into my room. I turned around and saw 宝贝 climbing stealthily up my bed, clutching her little bolster. She hasn’t come to my room in the middle of the night for months. She said “mama” in a soft voice and snuggled against me. The next day, she told grandma about it. Awwww…. I am so touched!! I must be the luckiest mom on Earth. Where can I find a sweeter and more sensitive little girl than her?? 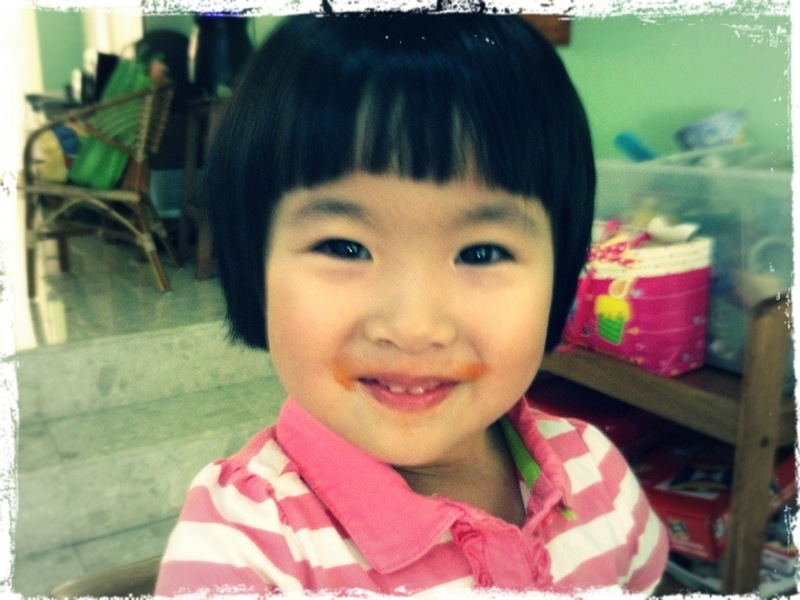 My darling with her orange carrot juice mustache. Hey lucky mummy zhiwei! thats so sweet of ur daughter!